Brian Tuck’s talk in November on the Brookes family of Sarawak was as interesting as promised and quite uplifting in that they took their responsibilities seriously and looked after the people over whom they ruled. They also extended the country substantially through some interesting business deals! We are looking forward to our outing to the Jewellery Museum and Soho House, (home of the Lunar Men) in Birmingham in June. We have a lovely enthusiastic membership and have sadly had to introduce a waiting list since at times the danger of having to sit on someone’s knee has seemed very real! We’ve had two great talks to start the new season. In September John Dornan gave a very interesting talk on “Sir Roger Casement: Hero or Villain?” and in October Andrew Morrison gave us a fascinating insight into “The Highland Clearances”, which were far more complex than I for one realised. In November Brian Tuck will be introducing us to “The Brookes Family of Sarawak”, who I think may have become the unlikely rulers of that country. After that feast for the mind in good company we plan to celebrate Christmas with a fuddle, Quiz and time to chat. Birmingham: with its famous jewellery quarter and a possible guided walk round the jewellery museum plus Soho House where the Lunar Society met. Lichfield: with its ancient cathedral and the former homes of Erasmus Darwin and Dr Samuel Johnson. We’ve had a good programme this summer, which has been well supported by our members. In May we heard about the redoubtable Ceilia Feinnes who rode round England in the 17th Century and kept a diary describing the stately homes of friends where she stayed, the villages she passed through and everything in between! June saw us catching up with Florence Nightingale as “The Bedridden Revolutionary” – most of us had no idea about her vast correspondence with persons of note to improve nursing care and public health after she returned from the Crimea. In July we learnt about the Franco-Prussian War and the tussles between various personalities nominally on the same side as well as the manoevering for position during the fighting. For many of us one of the high-lights of the summer was our trip to Gainsborough Old Hall in North Lincolnshire where our Guide, dressed for once in Pilgrim clothes rather than Tudor costume, took us through a rapid history of the British monarchy – accurate but very funny – and their association with Gainsborough as we sat in the great hall. Later after showing us the kitchens (and teaching us the derivation of some common sayings), the bedrooms and the view from the roof, she told us about the role the owners of the Hall played during the beginning of the Nonconformist Movement, which culminated eventually in the voyage of the Pilgim Fathers on the Mayflower. Our Guide was amazing (she left us to care for rescued hoglets at the local hedgehog sanctuary), the food in the cafe was good, the sun shone and the company was excellent! What more could we want? Our Autumn season looks interesting too, including as it does “Sir Roger Casement – Hero or Villain?”, “The Highland Clearances” and “The Brookes Family of Sarawak” leading up to our Christmas Fuddle! Recent talks have been lively and varied and ranged from Pirates and Raiders by Richard Coupland, through a fascinating talk on the “Communications and Carers in the Crimean War” by Ron Jones and “Feeding Napolean’s Troops” by Alan Windsor to a topic which many of us knew very little about “Greece in the World Wars” by Margaret Christopolous. For our April meeting we welcomed Isobel White who shared her research into the archives in “Vote 100”. She recently retired from the House of Commons after 38 years service, finishing as a Senior Librarian. She continues to work as a volunteer in the Archives and brought us details of Vote 100, (the special events organised to celebrate the suffrage granted to a limited number of women in 1918). She also described her work on the Oral History of the House of Commons in which the reminiscences of former back bench MPs were recorded. The different approaches to the interview were fascinating, but a common thread was the pain of losing the seat at a subsequent election. We learnt so much from presentations which were interesting and easily digestible and shared by good companions. What more can we ask? We’ve had a great Spring term with presentations on the English Poor Law, Samuel Pepys, Mediaeval Ilkeston, Jesse Boot and, during our review of the year in July, Book Marks! In June, several of us enjoyed a great day out at Middleton Hall, which is being restored after a period of neglect thanks to some sharp-sighted ramblers! Architecturally it covers several periods and did have a chapel until a 20th Century owner made two large archways through the end walls for his waggons to drive through! However, the highlight for many of us were the people who had lived there: Hugh Willoughby, the explorer who died on his arctic expedition to find a N.E. passage to China; John Ray, the father of English natural history; Francis Willoughby F.R.S. his friend and patron, knighted here by Queen Elizabeth and author of the first book on ornithology ever published. Middleton Hall also houses the fascinating Peel Society’s Museum charting the history of the Peel family and in particular Sir Robert Peel, probably one of England’s greatest peacetime prime ministers. Mike Taylor’s talk on 10th February gave us a fascinating insight into “Three Women who made a Difference” during the French Revolution and was very well received. Our Group outing this year will be on Thursday 8th June to Middleton Hall. We shall be travelling by car. Please could group members who are interested ensure your names are on the list. We hope to collect a £5 deposit for everyone at the March meeting. The History group has had a successful year with interesting and varied speakers. On 17th June several members visited Upton Hall, the home of the British Horological Society, which hosts a splendid collection of clocks and watches from the earliest lantern clocks through wonderful grandfather clocks to amazing atomic clocks. Alan Middleton, the curator gave an inspiring talk introducing us to the history of clock making and some special exhibits like the speaking clock and Scott’s old alarm clock which woke him every two hours during the night in the Antarctic to walk about and have hot drinks to avoid freezing to death! After a break of a few months, the Group is active again with many of the former members continuing to attend. The new leadership team is Ron Jones, Georgina Lyons, Judith Foxon and Margaret Jones. Many members have offered themselves, or their spouses, to give talks so that our programme for this session relies on their contributions on a wide variety of topics. In January, Brian Tuck introduced us to a remarkable man, Sir Stamford Raffles, the founder of Singapore, In February, Dennis Witcome explained how, some 50 years ago, he had used libraries and private collections of papers to gain information for his thesis on Charles II. Margaret Christopoulis then drew attention to the many sources now available on the internet, Study of primary sources can lead to the previously received wisdom being challenged. In ‘extra time’ there was a workshop in which methods of digitising paper illustrations and 35mm slides were demonstrated. We also hope to have a summer visit and are grateful to Catherine Tomlin and Cheryl Martin who are spearheading this new venture. Details will be released shortly. It will take another couple of months for our numbers to settle down. Meanwhile, we are still open to a few new members. Many of you will know, Jean, who has led this group since its inception, has decided to step down as leader of this group. It is hoped that the group will recommence in the new year, but there will be no further meetings this year. The History Group is now meeting in the Guild Room, CRMC. We continue to meet on the 2nd Friday each month in the CRMC Guild room at 10am. Since March we have had some excellent talks from eminent speakers. In March Mike Taylor gave a very enjoyable talk on the French Revolution and we were treated to a wonderful display of objects of the time. In May David Hutchinson made a very welcome return with a fascinating talk on the English Civil War. Looking ahead to June 12th we welcome Margaret Christopoles with a talk on the life and times of a 19th century Actress. It is a case of watch this space or the rolling notices at the open meeting, for a reminder when these talks take place. If you would like to receive any further information please email or ring me. The History Group meets monthly on the second Friday at 10am and talks take place in the Guild Room. We have an eminent speaker each month, mainly from Nottingham University, but also retired history teachers. They all have an extensive knowledge of their subject. We are mainly a non-participatory group, apart from looking and listening. In September Keith Oseman gave a talk on WW1 to commemorate the Centenary of the Great War. Professor Chris Wrigley returned in October to give a well-received talk on Lord Salisbury, a Conservative Prime Minister, who served three terms in office, and in November we welcomed back David Patterson with a talk on George Elliot, the pen name of Mary Ann Evans, who was one of the foremost Victorian playwrights. Looking ahead, our future programme is very exciting. On December 12th we will be with the Local History Group and holding our Christmas Social. There will be lots of goodies and Professor Richard Gaunt, an outstanding speaker, will be telling us all about Christmas Caricatures. Professor Maggie Walsh will be talking about American Women, Cars, and The Question of Equality on January 9th and we will have the welcome return of Dave Darby with a talk on the Life And Works of Sir John Gielgud. Since the last newsletter we have again had some excellent talks. In June we welcomed the very entertaining Dave Darby with his talk on the life of Noel Coward (Mad about the Boy). Dave uses a flip chart with his own very amusing caricatures of the stars. In July we had a very informative talk by Ron Jones on the Great Exhibition otherwise known as the Crystal Palace. In 1851 this exhibition was visited by thousands of people, which made it a great success. In August Norman Davis gave a talk on the Battle of Bosworth. We were taken right into the battle with vivid descriptions of the tumultuous day when Richard III was defeated and killed by Henry Tudor’s Army on Bosworth Field. Friday September 12th 10am A talk by Keith Osema on WW1, to commemorate the Centenary of the Great War. Friday October 10th 10am A talk by John Smart on the History of Rolls Royce. Friday November 14th 10am. A talk by David Patterson on the life of George Elliot. Author and Historian. Many thanks to all of the people who have given up their time to produce such excellent presentations. New Members are always welcome to come along and give us a try, if you are not sure then do give me a ring. Hello all you Historians, newsletter time again. Since March we have had three excellent sessions. Our March meeting was taken by David Pattison, who took us through the amazing life of Martin Luther King. In April we were treated to a talk by Professor Chris Wrigley on Benjamin Disraeli and at our May meeting Professor Margaret Welsh gave us a fascinating insight into the Californian Gold Rush. Most of our Presentations are PowerPoint, and we have to thank Alan Windsor for his help with the “technology”. We are all looking forward to our next three talks. August 8th Norman Davis on The Battle of Bosworth. The History group have enjoyed a most successful year in 2013. We have again been fortunate to have had excellent speakers at our monthly meetings. In December we had the return of Norman Davis who enthralled us with his talk on Rourke’s Drift. The battle in 1879 was fought and successfully defended by 150 British Colonial troops. The British garrison was attacked by 3000 – 4000 Zulu warriors. Eleven Victoria Crosses were awarded to the defenders. In January the speaker was Brian Tuck, who gave us an illuminating talk on Michael Faraday and the Royal Institution. Michael Faraday was an English Scientist who contributed to the fields of Electromagnetism. Finally in February we had the return of David Hutchison. The talk was entitled The Medieval Era English Towns 1150 to 1450. This was an excellent talk and enjoyed by all..
Friday 9th May. Margaret Walsh on The Californian Gold Rush. Membership of the group continues to grow and we have been privileged to have some interesting speakers over the year. In September Dennis Whitcombe gave us an illuminating account of his research on Charles II, the King who ascended the throne after the restoration of the Monarchy. In October Dr Jonathan Kwan gave a Talk on Psycho-analysing Viennese Culture, Sigmund Freud and Modernism 1890-1914. In November, Dave Darby returned with a wonderful talk on the History of Pantomime. We heard about the great stars of yesterday, with Dave giving impersonations of the personalities of the day. Friday December 13th Norman Davis on Rourke’s Drift plus Christmas Social. Small contributions of food please. We meet on the 2nd Friday of the month 10 am in the Guild room. Everyone Welcome. Membership of the group continues to grow and we have been privileged to have some very interesting speakers. In May we welcomed Dave Darby, a great entertainer, who spoke on the History of Music Hall. 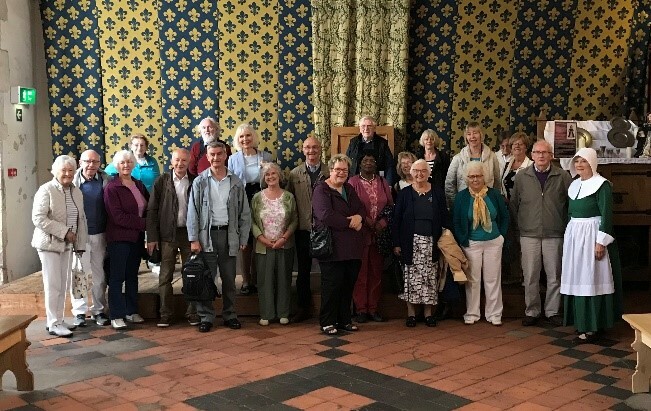 In June Dr Carol Mallia spoke on the History of Raleigh Cycles, and in July Breda Cooper gave a very interesting talk entitled Richard III – Saint or Sinner, and a lively debate ensued. August brought Professor Richard Gaunt who gave a brilliant talk on the rise and fall of Sir Robert Peel. September 13th, Dennis Whitcombe speaks on Charles 11 – Patriot or Plotter. October 11th Doctor Kwan talks on Viennese Culture 1890 to 1910. November 8th, Dave Darby returns with a talk on the History of Pantomime. December 13th, A talk on Rourke’s Drift from Norman Davies followed by the Christmas Social. These summaries do not do justice to the presentations and talks we have heard over the last few months, so do come along and experience for yourself. New Members are always welcome. The History group continues to meet on the second Friday of the month, at10am in the Guild room. We have enjoyed very interesting talks over the Spring, from Professor Chris Wrigley on Churchill in March, and Stephen Lamont from Nottingham University gave a talk in April on Pre. History of the Conservative Party. At the time of going into print we have a talk by History Teacher Norman Davis giving a talk on Rorkes Drift, made famous by the film Zulu. On Friday 12th June we will have a talk by Doctor Carol Mahill about the History of Raleigh Cycles, and n July 12th we have Dave Darby a local speaker and entertainer whose subject will be on the History of the Music Hall. If any of these speakers’ topics sound like something you would be interested in, do come along on Friday morning and give us a go. We are a very friendly group. New members are always welcome. The history group continues to flourish due to the enthusiasm of its members and their positive contributions. Over the winter months we have met as usual on the 2nd Friday of the month 10 am. In the Wesley room. On each occasion we have enjoyed some very interesting talks. In November we had great fun with the famous figures from history in the hot air balloon. Our December meet was Cheese and Wine with Christmas quiz. January was a very interesting talk by David on the American Revolution. We have excellent talks planned for the coming months. February 8th a talk on Scottish independence, late 13th century. Our March meeting March 8th brings a welcome return of Professor Chris Wrigley with a talk on Churchill. The History group continues to flourish due to the enthusiasm of its members and their positive contributions. Since the last report we have experienced several excellent talks. We are meeting on December 14th for our Christmas cheese and wine, plus a Christmas Quiz. In the New Year we have a welcome return of Professor Chris Wrigley, with a talk on Winston Churchill. Other topics for the New Year, The American Revolution, and the late 13th century Scottish War of Independence. Everyone welcome. Please join us Second Friday in the Month at 10am in the Wesley room at the CRMC. Everyone is welcome, so please join us. See you then. Over the past 3 months we have had an impressive array of talks. We began with Chris Wrigley, Professor of History at Nottingham University, who gave us a wonderful insight into the political life of David Lloyd George. In July we had an enjoyable discussion on villains of the past. The August meeting was speaker Nicky, who gave us an excellent knowledge and understanding of how History is taught in schools today. The group meets at C.R.M.C. on the second Friday of the month at 10am. Everyone is welcome, so please join us. The group goes from strength to strength. Our April talk was led by Sydney, who took us through the formation of railways in the18th and 19 century. It was an enjoyable talk illustrated with images of a bygone age. We also had a jolly history quiz. Our talk in May was given by Norman, a fascinating travel through Tudor England, when Lady Jane Grey was proclaimed Queen. Our speaker on June 8th, 10am, in the Wesley room, will be Chris Wrigley, Professor of History at Nottingham University. The talk will be on David Lloyd George. Do join us. Everyone welcome. The group is thriving and enjoying a variety of talks. We all enjoyed the cheese and wine at the December Meeting. In January and February, we explored members’ personal heroes of the 18th and 19th century. The March meeting will be an interesting talk on Law and Order in the 18th and 19th Century. We will be able to compare justice then, and up to the present day. We take an historical journey at every meeting. Going through all the eras from before the Romans until the 20th century. If you would like to join our lively group we meet on the 2nd Friday of the month at 10am in the Wesley room at the CRMC. You are very welcome. Come and join the U3A History Group. We had a very interesting talk this month by Cath and Ron. We have been covering the 18th and 19th century, including monarchy and public health. Future topics will be, My Hero, Law and Order and social aspects in the 19th century. We hope as winter nights begin to close in, you will consider joining us in December and the New Year. There was no meeting in November, but we will commence again on Friday December 9th at 10am. Wesley room at Chilwell Road Methodist Church. This talk will be followed by cheese and wine, (non-alcoholic). If you have an interest in History, do come and join us.